"As I lay dying." Steve Jackson hides out in his damaged filling station, trying desperately to repair the still form of Rom. His friend, police officer Artie Parker, arrives, demanding to know what is going on, and Steve tells Artie about the Dire Wraiths. The body of a dead Hellhound convinces Artie that something is up, and he agrees to help Steve get Rom to Brandy Clark's lab. While they are out trying to save Rom, Wraiths and Hellhounds break into the filling station and steal Rom's neutralizer, which is still surrounded by a force field. And far away at Project Safeguard, the wraith leader summons the Thornoids to finish Rom off. At Brandy's lab, Rom's friends, and Artie, try to resuscitate him, but before they can finish their work, the thornoids, which are sentient plant creatures, attack. Artie tries to protect Brandy and Steve and is killed by the thornoids. But now Rom is conscious again, and he attacks the thornoids, defending Steve and Brandy. Story - 4/5: This story is a continuation of the previous issue, in which Rom is electrified into unconsciousness during his battle with the hellhounds, and his neutralizer is trapped in a force field. In this issue, we mostly follow the struggles of the two humans Rom has befriended - Brandy ans Steve -- and their old pal Artie Parker, who has appeared in brief cameos up to this point. Artie is one of the early "red shirts" of the series -- a character Mantlo introduces and lets us get to know a little bit, and maybe even like, who is then killed off by the ruthless evil of the Dire Wraiths. Ordinarily, I shouldn't like this issue as much as I do, because Rom is in it only at the end. Most of the story focuses on Steve Jackson and, to a lesser degree, Brandy Clark. And although I like Brandy, I never did warm up to Steve when I originally read this series -- maybe because by the time I had started really collecting it, Brandy's love for Rom had become an open secret, and Steve was intensely jealous, often to the point of being rude to Rom. However, I had never read this issue before, and here we see, for the first time, the love triangle really crystallizing. After seeing Brandy's reaction to Steve's failure to save Rom -- throwing herself on Rom's metal body and accusing Steve of being willing to let Rom die to keep the two of them apart, I have a great deal more sympathy for Mr. Jackson than I used to. Here the poor guy has been dating the prettiest, sweetest girl in Clairton for months, thinking she loves him, only to discover now, in this very abrupt and painful way, that Brandy's true feelings are for the metal space-man. No wonder Steve became short with Rom in later issues. Therefore, we have here a very powerful piece of characterization. Steve is torn between wanting to help Rom, to whom he owes his life several times over already, and wanting Rom out of their lives and away from Brandy. Despite his jealousy, however, Steve's better nature wins out and he does enough to wake Rom up. Of course, once awake, Rom defends Steve and Brandy again, only increasing Steve's debt to the Silver Spaceknight. It's only issue 7 and we've already lost count of how many times over Steve owes Rom his life. On the other hand, Steve does lose his old friend Artie, who is killed by the thornoid plants before Rom comes to. The other really interesting development in the story is the capture of Rom's neutralizer. A fresh batch of hellhounds, this time led by a Dire Wraith, arrive at the filling station after everyone has left, and they find the neutralizer, still there, surrounded by an energy field. They make off with it, which is a matter of grave concern to any fan of Rom's -- because without it, Rom loses his greatest weapon, and his only means of banishing Wraiths to limbo. What will become of the neutralizer will need to wait for future issues, however. Overall, this was another strong story from Bill Mantlo. The characterization is solid, and Rom's two main supporting characters, Steve and Brandy, receive further development. Mantlo's writing demonstrates how powerful and important a good supporting cast can be, and he was never one to skimp on the other characters in Rom's life. And of course, Rom saves the day in the end, as he always does -- even seven issues in, we already see this as the pattern. 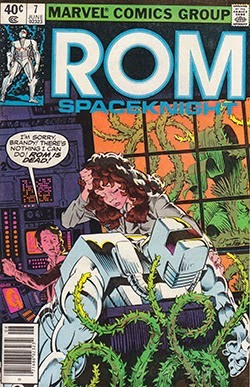 Rom is truly a Spaceknight, in the most chivalrous sense of the word. Art - 4/5: The artwork has Sal Buscema's usual solid quality, and we can see that Sal's style of drawing Rom, and especially the pen-light eyes, has matured into almost its final form. The fight scenes are kinetic and powerful, and drawn extremely well. As an interesting note, this issue represents the very first of the series colored by future Rom regular Ben Sean, who became one of the best colorists of the 1980s. Cover - 3/5: The cover is once again uncredited. Rom looks very Milgrom-esque, so he may have done the artwork, but Brandy and Steve do not look the way Milgrom usually drew them. Additionally, the inking looks much moodier than Milgrom's style usually achieves -- in fact, Rom's armor is inked in a way very much reminiscent of Akin and Garvey's style. This makes me wonder if the cover is very early work by the team that would eventually become the best inkers of the series. On the other hand, the Brandy and Steve don't look Akin-and-Garvey-esque either. Either way, the cover is interesting, and looks good, although Brandy seems a lot older than Buscema usually draws her on the inside. Overall Experience - 4/5: Overall, this is another strong outing for the creative team. Rom's story is in full swing, with Dire Wraiths, magic servants, and hellhounds galore. The story works well as a stand-alone -- you could easily follow it if this were your jumping on point -- but it also continues threads from the past and leads into the stories of the future quite well. One interesting note: in the letter column, in response to a reader asking them to show what the Dire Wraiths really look like when not shape-shifted, Bill Mantlo explains that Parker Brothers (the toy manufacturer that owned Rom) had control over the design, and Marvel had to wait until Parker Brothers produced it first. Presumably Parker Brothers intended to create and sell some Wraith toys as enemies of Rom, but so far as I know, they never did so. This may explain why, to my knowledge, the actual appearance of Wraiths was never shown in the Rom comic. In later issues, Buscema came up with a ghostly "transitory" form for the Wraiths -- a shape that is midway between shifts, which they use to speed up the shape-shifting process from one shape to another. But this is still not the actual, natural shape of the Wraiths. I am not sure that shape was ever revealed in the series. In later years, of course, Walt Simonson designed a new "Witchwraith" shape, which was revealed -- but the "Sciwraiths" were always shown in their transitory form as far as I can remember.